Moore Minutes: Who Gets a Pocket Full of Posies? this means MOST of you won't like reading this post! grateful and happy for the response this had! Thanks to each one of you for entering! 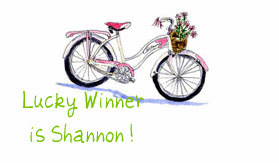 Congrats to Shannon Mangerchine ! You're the lucky one to receive those pretty posies straight to your mailbox! dang it! lol. just teasing... congrats shannon! enjoy! thanks for stopping by my blog, and for your kinds words.